Last year my parents attended the annual Bloom garden festival in the Phoenix park, Dublin. They raved about it, saying it would be a great day for myself, my husband and the kids. I intended on bringing the kids along this year but the June bank holiday weekend seemed to come up so suddenly I completely forgot. Then my husband won tickets on a Twitter competition courtesy of Neven Maguire and the main sponsor, Bord Bia. We attended today (Sunday) and the place was packed out. The weather was changeable but we knew to expect this so I packed all of our raincoats. The festival was much larger than I’d expected but incredibly well organised. Queues of traffic in and out were well managed. Parking cost €5 and there were plenty of portaloos and picnic tables and chairs. There were huge crowds but most people just ambled about and there was no pushing or squeezing. I was surprised by the scale of the festival and hadn’t expected it to be so good. The kids loved checking out all the elaborate gardens, albeit briefly. We visited pens of farm animals and they tried to pet the lambs through the gaps. The kids seemed to be constantly hungry and so we all indulged in some ice cream, shortly followed by some beautiful sprouts and raw energy bars made with cacao nibs, seeds and agave from the Happy Pear stall. The handsome twins weren’t there today but I spotted a few of their family members and younger brother Darragh (the one who grows the sprouts), working hard answering questions and selling stock which appeared to be jumping off the shelves. We listened to a lovely Irish band whose name I’ve forgotten! The kids sat quietly mesmerised by the live music. I’ve always wanted to bring the kids to hear live music, but in Ireland the only options are usually Trad sessions in a pub or a full-out concert. A little while later we were entertained by a Latin jazz trio who settled down in front of us to play. 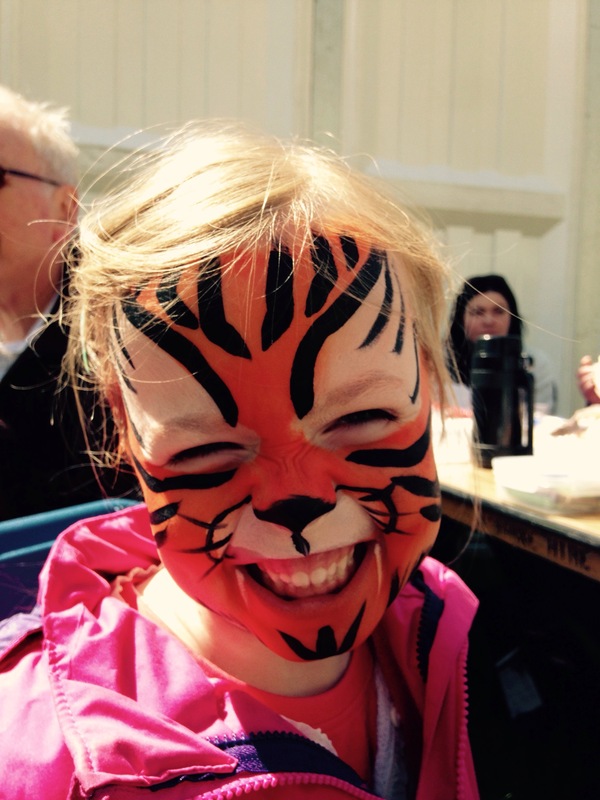 Eva queued patiently for 15 minutes to have her face painted as a tiger and spent the next 15 minutes shouting ‘Roar!’ at random strangers. Pretty vicious! We rounded the day off with a trip to the playground which was absolutely mobbed. It was hard to keep track of the kids but I was pleased to see a few security guards at the entrance. I’d hoped to grab a box of noodles before we left but a shower of rain came and the kids were reaching their tipping point so we thought we’d take the window to leave and we were right because within 10 minutes they both passed out asleep in the car – proof of an entertaining afternoon I think. It was a great day and we’ll definitely be back next year as there was something to appeal to our entire family. 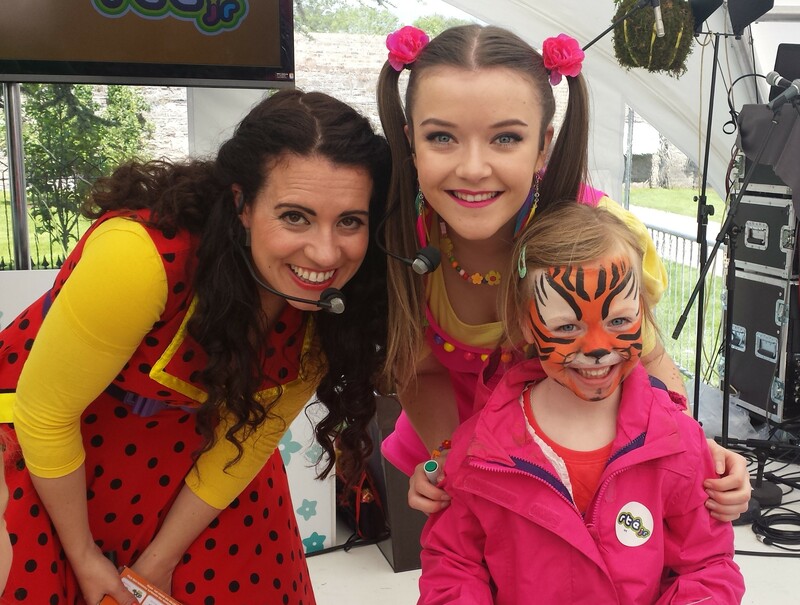 It is a fantastic family day out, and even if you leave the kids at home you could take some more time to appreciate the gardens, the gourmet food, cookery demonstrations (I missed one by Catherine Fulvio as the kids were getting hungry) and of course the craft beer bar. We were very lucky with the weather, and managed to dodge a few light sun showers. We spent 4 hours ambling about and we could easily have stayed longer if we didn’t have the long drive home and if the kids hadn’t been so tired. Next year we’ll arrive earlier, bring a picnic blanket and try to see and do more. Sounds like you’ve met my daughter Jackie! 😊 Hope you had a lovely visit back home.